A Palestinian civilian was killed and 2 civilians succumbed to their previous wounds. 99 Palestinian civilians, including 23 children, a woman, a male journalist, and a female journalist, were wounded; 3 of them sustained serious wounds. A Palestinian civilian was killed and 5 others, including 2 children, were wounded in the West Bank. Israeli warplanes launched 23 air raids, in which 46 missiles were fired at the Gaza Strip. 25 Palestinian civilians, including 7 children and 3 women, were wounded. 7 Palestinian officers in the Gaza Interior Ministry were killed after targeting their sites. Around 54 sheep, 60 doves and 160 chickens died. Al-Nakheel Resort sustained partial damages. PCHR documents 19 attacks using artillery shells. Israeli forces conducted 64 incursions into Palestinian communities in the West Bank and a limited incursion was conducted in the southern Gaza Strip. 59 civilians, including 3 children and 3 women, were arrested in the West Bank. 13 of them, including 2 children and 2 women, were arrested in Jerusalem. A civilian was arrested while attempting to sneak into Israel, north of the Gaza Strip. Israeli Municipality ordered 2 families to self-demolish 4 apartments in Beit Haninah village, so persons became homeless. A kindergarten and a woman center were demolished in al-Baba Mount Bedouin Community. Four Palestinian civilians were arrested at military checkpoints in the West Bank. Israeli forces arrested a businessman at Beit Hanoun (Erez) Crossing, north of the Gaza Strip. Israeli violations of international law and international humanitarian law in the oPt continued during the reporting period (19-25 July 2018). At approximately 00:50, Israeli forces moved into Beit Liqya village, southwest of Ramallah. They raided and searched a house belonging to Mohammed Mahmoud Ibrahim (20) and then arrested him. At approximately 02:00, Israeli forces moved into al-Am’ari refugee camp, south of Ramallah. They raided and searched a house belonging to Zuhair Akram al-‘Ejel (26) and then arrested him. Around the same time, Israeli forces moved into Abu Qash village, north of Ramallah. They raided and searched a number of houses after which they arrested 3 civilians namely Loqman Tahseen Qa’ad (22), Dia’a Mohammed Sarhan (19), Yasser Hayel Qa’ad (28). Around the same time, Israeli forces moved into Ethna village, west of Hebron. They raided and searched a number of houses belonging to Ahmed Hashem al-Tamizah, Lo’ai Salem al-Tamizah, Na’im Mohammed Bashir Salemiyah, Fadi ‘Ayed Abu Jahishah, and Arkam Mohammed al-Fasisi and then withdrew from the village. The Israeli forces handed Arkam Mohammed al-Fasisi a summons to refer to the Israeli Intelligence Service in “Gush Etzion” settlement complex, south of Bethlehem. At approximately 02:30, Israeli forces accompanied with 3 military vehicles moved into ‘Aqabet Jaber refugee camp, southwest of Jericho. They raided and searched a house belonging to Hakim Abdul Maqsoud Yaghi (25) and then arrested him. At approximately 03:00, Israeli soldiers moved into al-‘Abiyat village, east of Bethlehem. They raided and searched a house belonging to Baha’a Khader Nawawrah (21) and then arrested him. At approximately 04:20, Israeli forces moved into al-Jalazoun refugee camp, north of Ramallah. They raided and searched a house belonging to Mo’ataz Zuhair Dabour (19) and then arrested him. Around the same time, Israeli forces moved into Kafer Ne’mah village, west of Ramallah. They raided and searched a house belonging to Saif Mohammed ‘Abdah (30) and then arrested him. It should be noted that Saif was a former prisoner at the Israeli prisons and he served 5 years of imprisonment. At approximately 06:30, Israeli gunboats stationed offshore, adjacent to former al-Wahah shore, northwest of Beit Lahia in the northern Gaza Strip heavily opened fire at Palestinian fishing boats sailing within 3 nautical miles and chased them. As a result, the fishermen were forced to flee fearing for their lives, but neither casualties nor material damage was reported. At approximately 14:00, Israeli forces accompanied with a number of military vehicles moved about 100 meters into the east of al-Shawkah village, east of Rafah in the southern Gaza Strip. They leveled and the lands and repaired the border fence and the barbed wire. Few hours later, the Israeli forces then redeployed behind the border fence between the Gaza Strip and Israel. At approximately 15:00, an Israeli drone fired a missile at a group of civilians who were near a border control point, east of al-Shawkah village, east of Rafah in the southern Gaza Strip. As a result, a Palestinian officer in the Gaza Interior Ministry was killed and a civilian was wounded. The Israeli forces announced later that a drone targeted a cell of those who fired incendiary balloons near a site belonging to Hamas Movement in the southern Gaza Strip. At approximately 17:00, Israeli forces fired an artillery shell at a Border control point belonging to Palestinian armed groups, 300 meters into the west of the border fence with Israel, east of al-Shawkah village, east of Rafah into eh southern Gaza Strip, but no casualties were reported. Note: During the aforementioned day, Israeli forces conducted (3) incursions in the following areas and no arrests were reported: al-‘Aroub refugee camp, Deir al-‘Asal village and al-Salam neighbourhood in Hebron. At approximately 02:15, Israeli gunboats stationed offshore al-Sudaniyah area, west of Jabalia in the northern Gaza Strip, heavily opened fire at Palestinian fishing boats sailing within 3 nautical miles and chased them. The shooting recurred approximately 07:40 on the same day. As a result, the fishermen were forced to flee fearing for their lives, but neither casualties nor material damage was reported. At approximately 03:00, Israeli forces moved into Beit Ummer village, north of Hebron, and stationed in Safa neighborhood, west of Hebron. They raided and searched the house belonging to Mohammed Ahmed Ismail ‘Adi (60). The Israeli soldiers handed a summons to Mohammed’s son, Oseid, to refer to the Israeli Intelligence Service at “Gush Etzion” settlement complex, south of Bethlehem. In addition to that, an Israeli officer threatened the Mohammed ‘Adi, to raid and search his house frequently if he continued to deliver Friday speeches in the village mosque. The Israeli officer claimed that Friday speeches urge incitement. At approximately 08:00, Israeli forces moved into Taqu’a village, east of Bethlehem, and stationed in al Lawzya area. They raided yards of Taqu’a elementary school and a number of residential houses. An eyewitness told PCHR’s fieldworker that Israeli soldiers moved into several areas in the village, including the schools area, imposed strict measures, attacked the property of Taqu’a school, and damaged some of its outside doors. He added that the soldiers raided a number of nearby houses searching for stone throwers. However, no arrests were reported among Palestinian civilians. At approximately 10:00, Israeli forces moved into al-Khader village, south of Bethlehem, and stationed in Um Rokba area. They raided and searched a house belonging to the family of Mohammed Bassam Salah,(14) and arrested him. At approximately 16:50, Israeli forces stationed behind the border fence between the Gaza Strip and Israel, fired an artillery shell at a border control point belonging to the Palestinian resistance groups, east of al-Bureij in the center of the Gaza Strip. As a result, the border control point sustained material damage, but no casualties were reported. At approximately 17:00, Israeli forces, stationed behind the border fence between the Gaza Strip and Israel, fired several artillery shells at a border control point, belonging to Palestinian resistance groups, east of al-Zaytoun neighborhood, east of Gaza City. As a result, the border control point sustained material damage, but no casualties were reported. Around the same time, Israeli forces stationed behind the border fence between the Gaza strip and Israel, fired two artillery shells at a border control point belonging to the resistance groups, east of al-Shuja’iyah neighborhood, east of Gaza City. As a result, the border control point sustained material damage, but no casualties were reported. Around the same time, Israeli forces stationed behind the border fence between the Gaza Strip and Israel, fired an artillery shell at an empty land, east of al-Sheja’eya neighborhood, east of Gaza City, but no casualties were reported. Around the same time, Israeli forces stationed behind the border fence between the Gaza Strip and Israel, fired an artillery shell at an empty land, east of al-Zaytoun neighborhood, east of Gaza City, but no casualties were reported. At approximately 17:20, Israeli forces stationed behind the border fence between the Gaza Strip and Israel, fired an artillery shell at a border control point belonging to Palestinian resistance groups, east of al-Maghazi, in the center of the Gaza Strip. As a result, the border control point sustained material damage, but no casualties were reported. At approximately 17:25, Israeli forces stationed behind the border fence between the Gaza strip and Israel, fired three artillery shells at a border control point belonging to al-Qassam Brigades (The Military Armed Wing of Hamas Movement). The control point is located in south of Return encampments, east of Abu Safyia Hill, northeast of the Gaza Strip, 200 meters into the west of the border fence. As a result, the control point was completely damaged, but no casualties were reported. It should be noted that the targeted area is about 400 meters into the south of the Return encampments. The sounds of bombings caused fear among civilians, particularly children and women. it should be noted that the numbers of civilians are more than hundreds in the Fridays. Around the same time, Israeli forces stationed behind the border fence between the Gaza Strip and Israel, fired an artillery shell at a border control point belonging to Al-Qassam Brigades (the Military Armed Wing of Hamas Movement). The control point is located in al-Shuhada’a Islamic Cemetery, east of Jabalia in the northern Gaza Strip, 250 meters into the west of the border fence. As a result, the border control point sustained material damage, but no casualties were reported. At approximately 17:30, an Israeli drone fired a missile at a site belonging to Palestinian resistance groups (border control point), which is about 1 kilometer away from the border fence with Israel, and hundreds of meters away from the Return encampment in Khuza’ah. As a result, two members of the Palestinian resistance groups, who were inside the control point, were killed after being hit with shrapnel throughout their bodies. They were transferred to Gaza European Hospital, south of the city. PCHR’s fieldworker said that the bombing of the border point coincided with the participation of hundreds of civilians in the Return demonstrations, near the Return encampment in Khuza’ah. 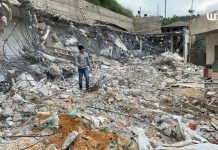 At approximately 17:45, Israeli warplanes launched 4 missiles at a livestock farm belonging to Majed ‘Allawi Ismail al-Sheikh (43). The 400-square-meter farm is located in the eastern borders adjacent to al-Hajja Hamda Street, east of al-Shuja’iyah neighborhood in the eastern Gaza Strip. As a result, the number of livestock killed is estimated at (54) sheep, (60) doves, and (160) chickens. In addition to that, a lot of livestock breeding equipment were damaged. Majed’s nephew, Ahmed Kamel ‘Allawi al-Shiekh (19), was also hit with shrapnel throughout his body. He was transferred to al-Shifa Hospital and doctors classified his injury as moderate. At approximately 17:50, Israeli forces fired an artillery shell at a border control point belonging to Palestinian resistance groups, 300 meters into the west of the border fence with Israel, adjacent to the Return encampments. The shell was fired while thousands of civilians were participating in the March of Return and Breaking Siege, east of al-Shawkah village, east of Rafah in the southern Gaza Strip. This caused fear among civilians, but no casualties were reported. At approximately 19:50, an Israeli warplane launched 4 missiles at al-Rawdah military site, near ‘Ali bin Abi Talib Mosque, in al-Zaytoun neighborhood, east of Gaza City. The shelling, which shook the densely populated area, caused the injury of 19 civilians, including 7 children and 3 women in addition to partial damage to buildings and facilities adjacent to the targeted site. At approximately 20:38, Israeli warplanes launched about 25 missiles, for half an hour, during 12 raids carried out on al-Qassam Brigades’ site (The Military Armed Wing of Hamas Movement), northwest of Khan Younis in the southern Gaza Strip. While no casualties were reported, the sound of the subsequent explosions caused fear among civilians, especially women and children. At approximately 21:30, Israeli warplanes launched 4 airstrikes, in which they launched 8 missiles, on a site belonging to Palestinian resistance groups, west of al-Bureij refugee camp in the center of the Gaza Strip. The airstrikes caused material damage to the site and al-Nakheel Resort, which is near the site. Moreover, civilians, who were in the resort and the wedding hall, panicked, but no casualties were reported. Note: During the aforementioned day, Israeli forces conducted (4) incursions in the following areas and no arrests were reported: Beitt al-Roush, al-Thaheriyah, al-Samou’a, and al-Shuyoukh villages in Hebron. At approximately 19:00, an Israeli forces arrested Sari Omer Mahmoud Kamil (30) a driver at Qabatiyah Directorate of Education, southeast of Jenin, after attacking him in Khan al-Ahmer Bedouin Community, east of East Jerusalem. The soldiers broke one of his rips while he was moving with solidarity activists from Jenin to Khan al-Ahmer. Eyewitnesses said to PCHR’s fieldworker that the Israeli soldiers attacked using electric shocks him after he attempted to remove military checkpoints. As a result, one of Kamil’s rips was broken. He was transferred to “Ofer” military camp, southwest of Ramallah. It should be noted that the Israeli forces established several sand barriers and put rocks to prevent the solidarity activists to reach Khan al-Ahmer, but the activists managed to remove the barriers and entered the community. Note: During the aforementioned day, Israeli forces conducted (4) incursions in the following areas and no arrests were reported: Hebron, Kharas, Nuba and Bani Na’im villages. At approximately 02:00, Israeli forces moved into Beit Omer village, southwest of Yatta, south of Hebron. They raided and searched 2 houses belonging to ‘Essa ‘Amer Ed’ais (40) and his brother Shehdah (38). The Israeli forces then withdrew and no arrests were reported. In the morning hours, Israeli forces moved into Barta’ah village, which is located inside the annexation wall, southwest of Jenin. They raided and searched many commercial shops and checked the ID cards of a number of civilians. They then arrested Ehab Ra’ed Zeyadat and Karim Ibrahim Manasrah from, both of the from Hebron. At approximately 20:30, an Israeli drone fired a missile at a group of civilians who were in the vicinity of the Return encampment in Abu Safiyah area, northeast of Jabalia in the northern Gaza Strip. As a result, a 29-year-old civilian from Jabalia was hit with a shrapnel to the back. He was transferred to the Indonesian Hospital in Jabalia to receive medical treatment and doctors classified his injury as moderate. The Israeli forces stated announced that a drone targeted a group of civilians who fired Incendiary kites in the northern Gaza Strip. Note: During the aforementioned day, Israeli forces conducted (3) incursions in the following areas and no arrests were reported: al-Shuyoukh, al-Thaheriyah villages and Hebron. At approximately 00:25, Israeli forces moved into Tulkarm. They raided and searched Beit Al Maqdes Company for Money Exchange belonging to Taqi Eden Abu Hasib. The soldiers then raided and searched Taqi’s house amidst firing rubber bullets, sound bombs and tear gas canisters at the house. As a result, many civilians suffered tear gas inhalation. The Israeli forces withdrew later from the city and no arrests were reported. The Israeli forces also confiscated the archive of money transfers from the company. At approximately 01:00, Israeli forces moved into Beta village, southeast of Nablus. They raided and searched a house belonging to Ahmed Isma’il Hammad Hamayel (23) and then arrested him. Around the same time, Israeli forces moved into al-Salam area in Hebron. They raided and searched a house belonging to Nahed Mohammed al-Fakhuri, who is deported to the Gaza Strip after the Israeli forces released him in the prisoners’ exchange deal. They then withdrew and no arrests were reported. At approximately 01:30, Israeli forces moved into Qalqiliyah. They raided and searched 2 houses belonging to Ismail Nedal Abu al-Sheikh (23) and Mahdi Mahmoud Dawoud (30). The Israeli forces then withdrew from the city and no arrests were reported. At approximately 02:00, Israeli forces moved into Beit Liqya village, southwest of Ramallah. They raided and searched a house belonging to Hani Sa’ed Dar ‘Asi (25) and then arrested him. At approximately 02:15, Israeli forces moved into Qifin village, north of Tulkarm. They raided and searched a house belonging to Mohammed Mashhour Jaber Salim. The soldiers caused material damage to a car belonging to Mohammed’s son Salim (27). They then withdrew from the village and no arrests were reported. In new crime of excessive use of lethal force against Palestinian civilians, Israeli forces killed a Palestinian civilian and wounded another one in al-Dahish refugee camp, south of Bethlehem. According to PCHR’s investigations and eyewitnesses’ statement, at approximately 03:00 on Monday, a group of “Mista’arvim” undercover units dressed like Palestinian civilians sneaked into al-Dahish refugee camp, south of Bethlehem, to carry out an arrest mission. After that, Israeli forces backed by 8 military vehicles moved into the camp from all its entrances. The Israeli military vehicles then patrolled al-Fineeq Street and al-Salam, al-Jarishah, al-Walijah, al-Ja’afrah, al-Hawouz, and al-Dahiyah neighborhoods. The Israeli soldiers raided and topped roofs of dozens of houses and buildings, raided many shops after blowing up their doors and damaged their contents. Meanwhile, dozens of Palestinian young men gathered and threw stones and Molotov Cocktails at the Israeli soldiers, who heavily fired live and rubber bullets and tear gas canisters at them. At approximately 14:30, the confrontations, in which live bullets were used against protesters, escalated and extended to the camp’s main entrance. As a result, Arkan Thaier Helmi Mizher (15) was hit with a live bullet that penetrated his heart and exited his back. Arkan sustained serious wounds and was then taken to al-Hussain Hospital in Beit Jalah, where his death was announced. Moreover, another civilian was hit with a live bullet to the left foot and doctors classified his wounds as moderate. On the same day morning, the Israeli forces arrested 3 civilians namely Mohammed ‘Adnan Abu ‘Ayash (25), Jamal ‘Emad al-Sar’awi (26) and Raji Ahmed ‘Oudah (24) and then withdrew. At approximately 03:00, Israeli forces moved into Nuba village, west of Hebron and stationed in the eastern neighborhood. They raided and searched a house belonging to Mahmoud D’ais Harb (39) and then arrested him. At approximately 03:30, Israeli forces moved into Barqa village, northwest of Nablus. They raided and searched a number of houses and then arrested 4 civilians namely Maher ‘Ata Salah (22), Sa’ed Mohammed Sa’ed Hejjah (19), Samer Yasser Daghlas (18) and Mustafa Ahmed Abu Shabib (19). At approximately 14:50, an Israeli drone fired a missile at a group of civilians who were walking near al-Shuhada’a Islamic Cemetery, east of Jabalia in the northern Gaza Strip, but no casualties were reported. Following that, the Israeli forces issued a statement, announcing an Israeli drone targeted a Palestinian cell that participated in setting several fires due to firing incendiary kites and balloons towards the Gaza strip enclave. Note: During the aforementioned day, Israeli forces conducted (3) incursions in the following areas and no arrests were reported: Ethna village and al-Fawar refugee camp in Hebron; Deir Sharaf village, northwest of Nablus. At approximately 01:00, Israeli forces moved into Bethlehem and stationed in Ma’ali Valley in the center of the city, and Hendaza, east of the city. They raided and searched a number of houses after which they arrested 4 civilians namely Mahmoud Ibrahim Jawarish (24), Mohammed Nasser ‘Awad (22), Majd ‘Awad (23), and Osamam ‘Ayad al-Haremi (20). Khalid al-Haremi, Osama’s uncle said to PCHR’s fieldworker that Osama’s mother was attacked by police dogs and fell on the ground. The dogs bit her hand, causing wounds in one of her fingers. At approximately 01:40, Israeli forces moved into Shuweikah Suburb in Tulkarm. They raided and searched a house belonging to Mohammed Jamal Abu Laimoun (22) and then arrested him. At approximately 02:00, Israeli forces moved into Tulkarm. They raided and searched a house belonging to Omer Saleh Khalid Lafdawi (21) and then arrested him. Around the same time, Israeli forces moved into Lawzah area, west of Hebron. They raided and searched a house belonging to Hazem al-Fakhuri (45) and then arrested his wife writer Lama Yasser Khater /al-Fakhuri (42). Meanwhile, another Israeli force raided and searched a house belonging to Netham Yasser Eden Shehadah (54), former Director of the Education Office in the south, in al-Jeldah area, and then arrested him. Feras al-Sabbah, lawyer at the Palestinian Prisoners Club, who managed to visit prisoner Lama in “Ashkelon” prison, said on behalf of her that the Israeli forces took her after arresting her to “Kiryat Arba” settlement, east of Qalqiliyah, where she stayed until approximately 07:00 on the morning. She was then transferred to “Ashkelon” prison. Lama informed the lawyer that since her arrival to the prison, she underwent a harsh and intensive investigation while she was tied to a chair all the time. The investigators also deprived her from sleeping and cursed all the time in addition to the continued shouting. It should be noted that a court hearing will be held for the abovementioned prisoner on Thursday, 26 July 2018. Around the same time, Israeli forces moved into Kuber village, north of Ramallah. They raided and searched a house belonging to Yusuf Ahmed al-Barghuthi (19) and then arrested him. Around the same time, Israeli forces moved into al-Birah and stationed in al-Jenan neighborhood. They raided and searched a number of houses after which they arrested Ibrahim al-Sayed Abu Sharifah (27), Saleh Mahmoud Abu Sharifah (22) and Emad Akram al-Sous (28). At approximately 02:20, Israeli forces moved into Noor Shams refugee camp, east of Tulkarm. They raided and searched a houses belonging to Nasser Jaber Nasser. They then withdrew from the house and no arrests were reported. At approximately 04:40, Israeli forces moved into al-Khader village, south of Bethlehem and stationed in al-Balou’a. They raided and searched a house belonging to Tareq Saleh al-Jahalin (22) and then arrested him. At approximately 14;15, an Israeli drone fired a missile at a group of civilians who were in the eastern side of the Eastern Cemetery, northeast of Gaza, but no casualties were reported. At approximately 17:20, Israeli gunboats stationed offshore, west of Khan Younis in the southern Gaza Strip, heavily opened fire at Palestinian fishing boats sailing within allowed fishing area and chased them. The shooting sporadically continued until approximately 21:00 on the same day. As a result, the fishermen were forced to flee fearing for their lives, but neither casualties nor material damage was reported. At approximately 18:40, an Israeli warplane launched a missile at a group of civilians who were near “Karny” Industrial Area in eastern Shija’iyah in eastern Gaza City. as a result, 3 civilians sustained shrapnel throughout their bodies. Doctors classified their injuries between minor and moderate. Note: During the aforementioned day, Israeli forces conducted (4) incursions in the following areas and no arrests were reported: Qalqiliyah, Hebron, al-Kume and Deir al-‘Asal villages. At approximately 01:00, Israeli forces moved into Nablus and stationed in al-Ma’ajn neighborhood, northwest of the city. They raided and searched the fifth floor in building No. (8) belonging to An-Najah National University housing and then arrested Mo’ath Ghassan Nayef Talab Thuqan (31). At approximately 01:30, Israeli forces moved into Balata refugee camp, east of Nablus. They raided and searched a house belonging to Hasan Na’im Bakhit (30) and then arrested him. Around the same time, Israeli forces moved into Kafer Qalil village, southeast of Nablus. They raided and searched a house belonging to Sameh Hammad Wajih Mansour (32) and then arrested him. Around the same time, Israeli forces moved into Birzeit village, north of Ramallah. They raided and searched a house belonging to ‘Essa Eyad al-Shalaldah (22) and then arrested him. Around the same time, Israeli forces moved into Jawhar Mount neighborhood in the eastern side of Hebron. They raided and searched a house belonging to Ziyad Sa’ad Banat (38) and then arrested him. At approximately 02:30, Israeli forces moved into Qabatiyah village, southeast of Jenin. They raided and searched a house belonging to ‘Ali Taiseer Zakarnah (20) and then arrested him. Around the same time, Israeli forces moved into Yatta, south of Hebron and stationed in Roq’ah area. They raided and searched 2 houses belonging to Ziyad ‘Oqab al-Nawaj’ah (33) and Mousa Mustafa al-Najjar (38) and then arrested them. Around the same time, Israeli forces moved into Surif village, west of Hebron and stationed in the western neighborhood. They raided and searched a house belonging to Omer Mohammed al-Heeh (36) and then arrested him. Around the same time, Israeli forces moved into al-Dawhah village, west of Bethlehem. They raided and searched a house belonging to Farouq ‘Essam Abu al-‘Akar (24) and then arrested him. At approximately 19:45, Israeli tanks stationed behind the border fence between the Gaza Strip and Israel, east of the Gaza Strip, fired an artillery shell at a site belonging to Palestinian armed groups, but no casualties were reported. Ten mintues later, the Israeli tank fired 2 artillery shells at an agricultural land, east of al-Maghazi refugee camp, but no casualties were reported. Around the same time, Israeli forces stationed behind the border fence between the Gaza Strip and Israel fired an artillery shell at an agricultural land adjacent to Abu Qatroun Gate, northeast of al-Buraij in the central Gaza Strip, but no casualties were reported. At approximately 20:20, Israeli forced stationed behind the border fence between the Gaza Strip and Israel fired an artillery shell at a border control point belonging to al-Qassam Brigades (the Military Armed Wing of Hamas Movement). The border control point is located inside al-Ghoul land in al-Sefa area, northwest of Beit Lahia in the northern Gaza Strip, 250 meters into the south of the border fence. As a result, the border control point was completely damaged, but no casualties were reported. Around the same time, Israeli forces stationed behind the border fence between the Gaza Strip and Israel fired an artillery shell at a border control point belonging to al-Quds Brigades (the Military Armed Wing of the Islamic Jihad). The border control point is located inside al-Ghoul land in al-Sefa area, northwest of Beit Lahia in the northern Gaza Strip, 250 meters into the south of the border fence. As a result, the border control point was completely damaged, but no casualties were reported. Around the same time, Israeli forces stationed behind the border fence between the Gaza Strip and Israel fired 2 artillery shells at a border control point belonging to Palestinian officers in the Gaza Interior Ministry near al-Motabeq Gate, east of al-Shawkah village, east of Rafah in the southern Gaza Strip. However, no casualties were reported. At approximately 20:30, Israeli forces stationed behind the border fence between the Gaza Strip and Israel fired 2 artillery shells at a border control point belonging to Palestinian officers in the Gaza Interior Ministry near Karm Abu Salem crossing, east of al-Shawkah village, east of Rafah in the southern Gaza Strip, but no casualties were reported. Note: During the aforementioned day, Israeli forces conducted (4) incursions in the following areas and no arrests were reported: Halhoul, Beit ‘Awa, Beit al-Roush and al-Mawreq villages in Hebron. On Wednesday, 18 July 2018; Israeli authorities allowed 3 persons; and on Sunday, 22 July 2018, 3 other persons to return to the West Bank. On Wednesday, 18 July 2018, Israeli authorities allowed a Christian to travel to the West Bank. On Sunday, 22 July 2018, Israeli authorities allowed 2 persons; and on Monday, 23 July 2018, one person, who work at the General Authority of Civil Affairs (GACA) and internationals to renew their permits. On Sunday, 22 July 2018, Israeli authorities allowed 2 doctors to travel via the crossing to attend a medical training course. On Monday, 23 July 2018, Israeli authorities allowed 15 farmers to travel via the crossing to attend an agricultural training course. At approximately 17:00 on Tuesday, 24 July 2018, Israeli forces stationed at Beit Hanoun (Erez) Crossing, north of the Gaza Strip, arrested Sabri Khadir Abdul Qader Qandeel (56), from Tal al-Hawa neighborhood in Gaza City. Sabri’s son, Mohamed, said to PCHR’s fieldworker that at approximately 08:00 on Tuesday, his father headed to Beit Hanoun (Erez) Crossing, pointing out that his father is a businessman and always travels through the crossing. At approximately 17:00 on the same day, Sabri’s family received a phone call from the Palestinian Liaison informing them that the Israeli Intelligence Service arrested his Sabri. Hebron: Israeli forces established (25) checkpoints all over the city. On Thursday, 19 July 2018, Israeli forces established 4 checkpoints at the southern entrance to Halhoul village and at the entrances to Taramah, Raboud and Beit Ummer villages. On Friday, 20 July 2018, Israeli forces established 3 checkpoint at the entrance to Khelet al-Madami’, west of Beit Ummer; at the entrance to al-Shayyoukh village; and at the entrance to al-Fawar refugee camp. On Saturday, 21 July 2018, Israeli forces established 2 checkpoint at the entrance to Sureef village and at the western entrance to Hebron. On Sunday, 22 July 2018, Israeli forces established 4 checkpoint at the entrances to Sa’ir and Beit Ummer villages and on Wad al-Jouz and Abu Risha Road. On Monday, 23 July 2018, 5 similar checkpoints were established at the entrances to Hebron, at the entrance to al-Fawar refugee camp, and at the entrances to Beit ‘Aynoun, Jalajil and Abu al-Ghuzlan villages. On Teusday, 24 July 2018, Israeli forces established 5 checkpoints at the northern entrance to Yatta, at the entrance to Beit ‘Omran village, at the entrances to al-Fawar and al-‘Aroub refugee camps, and at the entrance to Samou’a village. On Wednesday, 25 July 2018, 2 similar checkpoints were established at the entrance to Taramah village and at the southern entrance to Halhoul village. Qalqiliyah: Israeli forces established (9) checkpoints all over the city. On Thursday, 19 July 2018, Israeli forces established 3 checkpoint at the eastern entrance to Qalqiliyia and at the entrances to Jinasafout and ‘Izbit al-Tabeeb villages, east of the city. At approximately 06:45 on Saturday, 21 July 2018, Israeli forces established a checkpoint at the eastern entrance to Qalqiliyia. At approximately 02:00 on Sunday, 22 July 2018, Israeli forces established a checkpoint at the entrance to ‘Izbit al-Tabeeb village. At approximately 10:35, a similar checkpoint was established at the entrance to al-Nabi Iyyas village, east of Qalqiliyia. On Monday, 23 July 2018, Israeli forces established 3 checkpoint at the eastern entrance to Qalqiliyia and at the entrance to ‘Azoun village, east of the city (was established 2 times). At approximately 09:30 on Saturday, 21 July 2018, Israeli forces established a checkpoint at the entrance to Qarawet Bani Hassan village, northwest of Salfit. At approximately 11:00 on Sunday, 22 July 2018, a similar checkpoint was established at the entrance to Qarawet Bani Hassan village. At approximately 21:20 on Monday, 23 July 2018, Israeli forces established a checkpoint at the entrance to Dir Balout village, west of Salfit. At approximately 22:40, a similar checkpoint was established at the entrance to Kaful Hares village, north of the city. On Monday, 23 July 2018, Israeli forces arrested 2 shepherds in ‘Ayin al-Sakout area in Northern Jordan Valley. The two shepherds were identified as Ahmed Hussain Abu Muhsen (27) and faieq Mostafa Daraghmah (48). Local sources said that the Israeli forces arrested the abovementioned civilians after chasing them into their agricultural filed. At approximately 19:30 on Monday, 23 July 20189, Israeli forces established a checkpoint under ‘Azoun village’s bridge, on a road connects between Qalqiliyia and Tulkarm. They arrested 2 civilians, one of them is an officer at the Palestinian National Security Service. The two civilians were arrested while attempting to flee from a military checkpoint. The Israeli forces also confiscated a vehicle carrying the abovementioned civilians. The arrested persons were identified as Rashid Nizar Rashid Shubitah (28) and Nassar Mohamed Dahbour (33) both of them are from ‘Azoun village, east of Qalqilaiya.